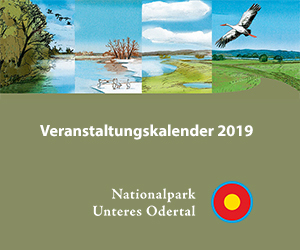 The “Wild Forest Trail” (“Wilder Waldweg“)invites you on a seven-kilometre long hike and makes the spring landscape south of Criewen and the Densen Mountains a real experience. The “Wild Forest Trail” truly deserves its name. It starts at Criewen Lenné Park and winds past fallen trees into the forest wilderness area south of Criewen. It leads via the spring adventure path, whichwinds its way through an ash forest as a 135-metre-long, dry footed, wood-plank pathway. This microcosm is one of the most fascinating biotopes of the Lower Oder Valley. Visitors can examine the spring, take sediment with a sieve and, with a little luck, discover the Alpine Planarian Worm – a species of flatworm that has been here since the most recent Ice Age. Outside the hiking trail, humans do not interfere with nature anymore. The forest belongs to the National Park’s wilderness zones and is left completely to natural evolution. The deadwood of dead trees proverbially brings new life to the forest. Deadwood is used by a variety of organisms adapted to this habitat. Depending on the type of wood and the state of the decaying process, about 600 species of large mushrooms and more than 1,300 beetle species are involved in the complete decomposition of a wood body. The forest is distinguished by diverse local conditions. With its foothill elevations, wet melt water channels and hollows, it creates completely different habitats. In spring, visitors can experience yellow anemones, Ficaria verna, marsh marigold (Caltha palustris) and Paris quadrifolia in the lower areas. Here, the forest is dominated by alders, ash and elm trees. At higher altitudes where the trail is, an entirely different picture is to be found. A dry and diverse mixed forest has formed there, dominated by the common beech. On the ground, small-flowered touch-me-nots (Impatiens), wood sorrels (Oxalis acetosella) and early-dog violets (Viola reichenbachiana) are found. The animals that live here include various species of woodpeckers, such as the lesser spotted, black, great spotted and green woodpeckers. It is particularly impressive to observe the black woodpecker; which is the largest woodpecker in Central Europe with a length of up to 50 centimetres. It finds excellent living conditions in this wilderness. Black woodpeckers hammer their holes for breeding and sleeping into the strong trunks of dry or dead trees. Other birds to be encountered here are oriole and short-toed tree creepers. Black and red kites also breed in this forest. Wild boars, deer and fallow deer as well as badger, fox and racoon dogs are also native to this area. The “Wild Forest Trail”, which initially runs along the “Path of Floodplain Views”, leads through the Densen Mountains, whose round hills rise up to 30 metres above sea level at their highest point. They are a typical ground moraine area formed by the most recent Ice Age, the Weichselian glaciation more than 15,000 years ago. The edge of the glacier located in the Pomeranian phase compressed the landscape with enormous force, pushed it upwards and thus shaped the present-day Densen Mountains. The yellow sand consisting of quartz granules, which predominates here, is eye-catching. In addition, there are pebbles and other stones, which can reach the size of a head.